Gradient base done with sample strips. Sample strips are the new thing coming to my shop on 01/10/2014 and will allow you to try out a polish without committing to a whole bottle. We’ve all been there, bought a bottle and not liked the way it dries, it lasts or it just doesn’t suit your colouring. So sample strips will be a cheap, one off purchase to let you try it out. They’re simply a strip of the polish that has been ready dried and can be cut up like a decal to be applied to your nail. Since it is made with nail polish it is as easy to remove as a regular manicure. 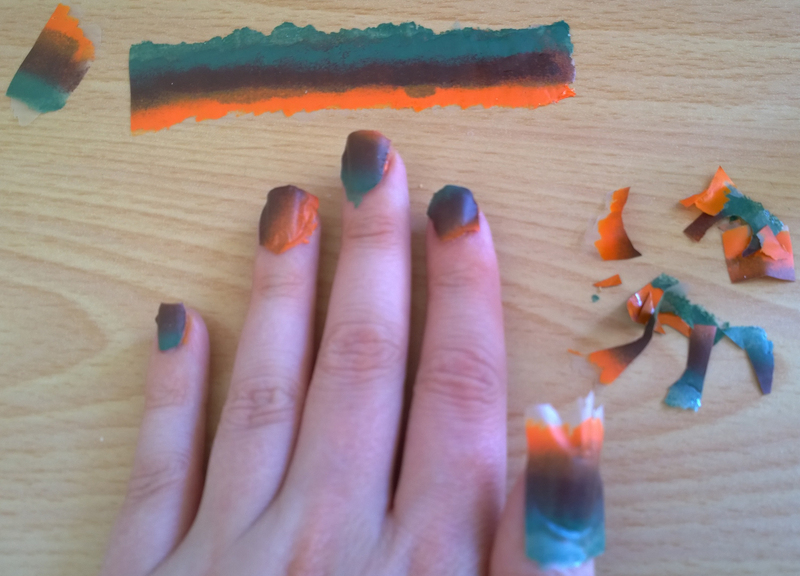 Of course I couldn’t just do a “this is what it looks like”, I had to do some fancy nail art to go with it. 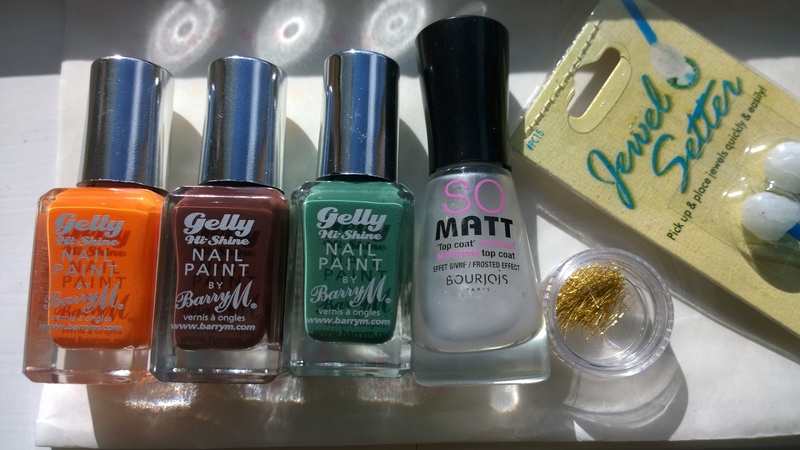 For this I used 3 Barry M Gelly nail paints (Mango, Cocoa and Cardamom), Bourjois “So Matt” top coat, gold slivers (available from http://www.thenailasaurus.com/) and some sticky jewel setters to position the gold slivers. I created the gradient on some backing paper and left it to dry. Once fully dried I cut it into pieces roughly the width of my nails. After doing this I ended up with 2 spare pieces and they were more than long enough as well. I used Bourjois base coat on my nails then stuck each piece on and smoothed them down. One hand done! I trimmed each piece down to roughly the size and shape of my nail then used a brush with acetone to complete the clean up (not very well I might add but I was feeling lazy). Once clean up was finished I applied my top coat to ensure it stayed sealed down onto the nail. Final step was to apply top coat to the accent nail and drop bits of gold sliver on in the shape of a leaf. Sorry about the slightly blurry picture. 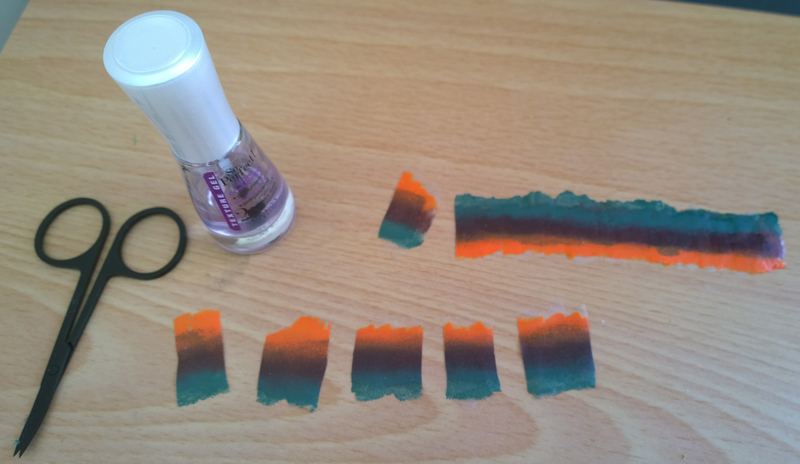 But there you have it, quick and simple sample strips that allow you to try out a new polish with no commitment!